The pilot of a plane carrying 33 passengers was forced to take emergency action after the aircraft nearly stalled mid-air as ice rapidly formed on its wing. 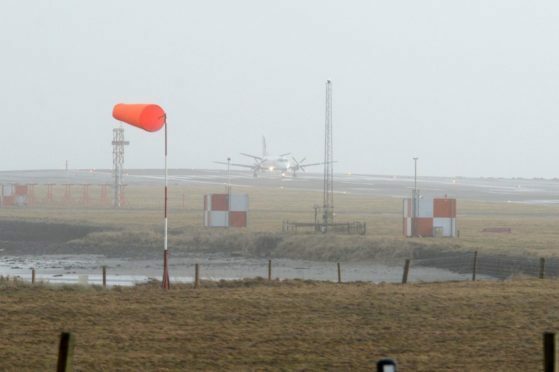 A report by the Air Accidents Investigation Branch (AAIB) reveals that the flight from Edinburgh to Sumburgh found itself in difficulty after hitting turbulence while flying through thick cloud. As that intensified, ice began to quickly form on the Saab-Scania plane’s upper wing, causing a worrying performance loss. The “stick shaker”, which warns the pilots of an imminent stall, activated three times while the flight’s co-pilot wrestled with the controls. The report revealed that he brought the flight into 500ft descent in order to pick up speed and clear the wing. Those actions soon enabled the flight to resume without further difficulty. The incident, which took place on the afternoon of June 5 last year, has been reported in the latest AAIB bulletin. There were no injuries as a result of the incident. Safety action is, however, being taken by the European Aviation Safety Agency, the operator and the manufacturer to implement an improvement that would address concerns about repeated activation of the stick shaker in the latter stages of an approach. The AAIB’s report said: “During the climb after departure from Edinburgh Airport, the aircraft encountered severe icing and turbulence. “With the autopilot engaged the aircraft started pitching up and down to maintain the selected indicated air speed. “Suddenly the turbulence intensified and ice began to form quickly on the aircraft. “The stick shaker activated and the autopilot disconnected. The co-pilot, who was pilot flying, attempted to accelerate the aircraft by reducing the pitch attitude. “He then re-engaged the autopilot but, after 13 seconds, the stick shaker activated again and the autopilot disconnected. “Shortly afterwards, the stick shaker activated for a third time and the co-pilot began a descent. “The aircraft lost around 500ft during the manoeuvre during which it accelerated and then recovered to normal flight.